Woodworkers Journal recently released a free walnut book case plan as part of their web ezine offering; every issue features three free plans from their vast library. I usually enjoy reading Rob Johnstone in the ezine, but I'd be lying if I said I didn't like the free plans they offer, too. More often than not, the plans do not appeal to me for any project, but I always at least examine them in superficial depth looking for a technique, or detail I haven't seen before. 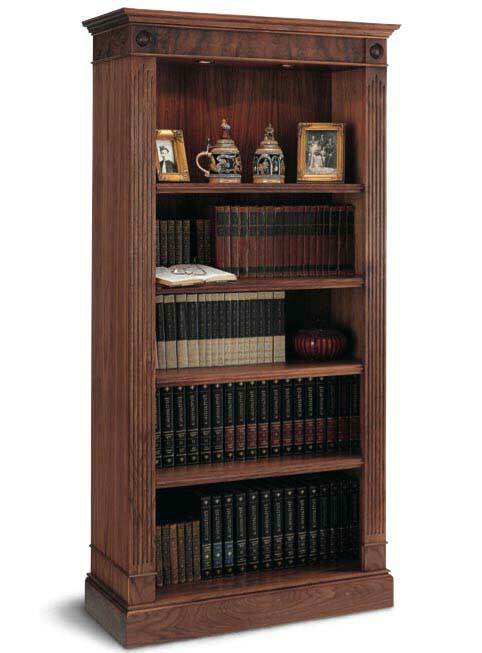 The walnut book case hit me hard and I am immediately making plans to build at least two of these book cases. The free download is is no longer available, but the plan is for sale all the time here. I'm changing their plan to suit me and my tools, and I'd love to see some feedback on my design ideas. I don't have (nor even asked) permission to post details from their plan here, so I will confine my commentary as much as possible to the obvious details visible in the above photo from their site. In essence this book case is a plywood box with ornamentation glued on. Purists may scoff, but a dressed up plywood box is not a Bad Thing in my philosophy. Using less expensive materials makes this project more accessible to those with lesser means; using 'bolted' on ornamentation makes the project more accessible to those with lesser skill levels. Sounds like this project has my name written all over it. Ultimately, the modular nature of this project lends itself to skilling up or down in certain areas. The faux fluted stiles on the front, for example, are easily produced by hand, machine, or pocketbook. Every part of this case can be purchased at the home center store and merely assembled. Or you can shoot higher. All the moldings can be produced with planes, or a router and then cut free from boards. Similarly, fine hardwood can be swapped for the plywood panels in the carcase. My first change is lighting. I really like the down lights at the top of the case. As your eye goes down, though, things get a little darker. I plan to put lights on the bottom at the rear facing up, too. The shelves will necessarily stop about 3/4 of an inch from the back to allow the light to go up/down. A book stop of 1/4" to 3/8" in height will be added to the back of the shelf. I hope to create a back-lit effect to display all the contents. The next change is at the bottom, or plinth, of the cabinet. The wrap around molding is another faux effect. I intend use real hardwood, hopefully walnut, for the plinth. Maybe I'm reaching, but I want to try my hand at blind dovetails. The bookcase seems ideally suited for experimentation because I can always back out and build to the plan. The original plan calls for thin high grade plywood for the back. I want to use 1/2" thin tongue and groove bead board. This is the most uncertain aspect because I don't have the tooling to create the wanted effect and am unsure if I can buy my way out of the problem. I may glue up a panel and make a crude scratch stock to do the beading detail. Here at the end is my pie-in-the-sky wish. I don't know if I can afford it, but I'd really like to use these rosettes in place of the stock circular style featured in the plan. I went to the two local home centers and priced the plan as it is published. The materials come in at roughly $225.00 per unit, including the puck lights.